We've decided to take a closer look at pies, a food so closely linked to London. 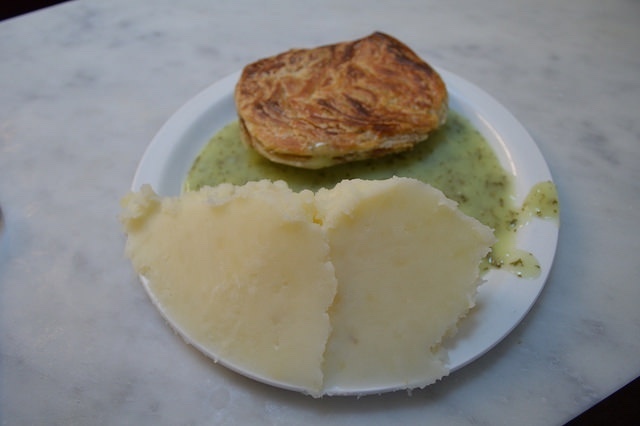 Over time eel, pie and mash shops have become institutions in the capital — and also comprise several of the oldest and most historic surviving eateries. The earliest pies are thought to have originated in Ancient Egypt circa 2500 BC, made from ground oats or wheat wrapped around a honey filling — perhaps the food that sustained them through the building of the pyramids. But it was the Greeks who first developed a recognisable pastry made with flour and water, and then the Romans — circa the second century BC — who started to play with a range of fillings and create the meat pies that are common today. It’s with the Roman conquest of Britain, beginning in 43 AD, that pies made it to our shores. Fast-forward to the Victorian era and pies became popular street food — there were no burgers or hot dogs back then. Lacking the funds for premises, several hundred so-called piemen would walk the streets selling their wares, particularly in east and south-east London. They came with a number of different fillings including meat and fruit, but most commonly eels. Eels were particularly common (and thus cheap) in London at the time. They were one of very few fish that could survive in the heavily-polluted Thames and other London rivers. And even more arrived from Europe into Billingsgate Fish Market, which started on the banks of the Thames (close to modern day Monument Station) in the 16th century. Gradually, pie and mash moved off the streets and into premises, giving birth to the ornate Victorian shops which we still see today. It’s thought that the first shop opened in 1850 — though it isn’t named — and before long such pie 'n' mash outlets were commonplace. These shops would also sell the Cockney classic of jellied eels, and usually have stalls outside selling live eels to be cooked at home. Inside there would be marble floors and counters — typical for the time, but unmistakably grand when viewed today. The walls would usually be covered in paintings and later photographs, with floors strewn with sawdust to gather up the eel bones that were spat out. It was in these shops that the offering was tweaked and modernised. Minced beef or lamb with onions became a more popular — and still affordable — pie filling than eels, while mashed potatoes quickly gained popularity as an accompaniment to bulk out the dish. Eels still played a crucial part though. The water used for stewing them was flavoured with parsley to create eel liquor, a sauce which tends to be a lurid green colour and is served with the pies in place of gravy. 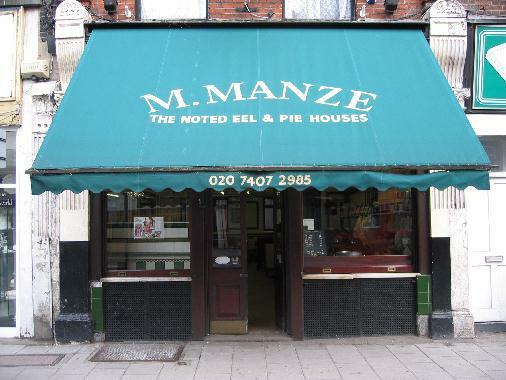 While pie and mash shops at their height were as popular as burger restaurants or curry houses are now, there are two key families who have been particularly influential over the years: the Manzes and the Cookes. 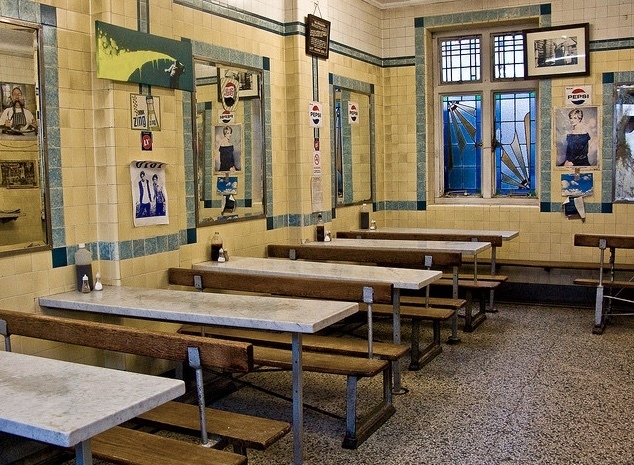 Together they run London’s oldest existing pie and mash shops. 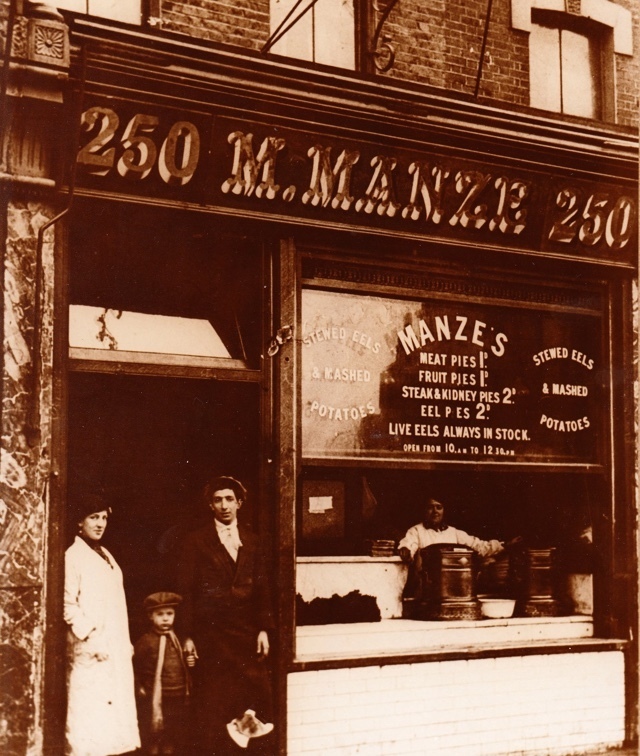 London’s oldest existing pie, mash and eel shop is M. Manze, which opened on Tower Bridge Road in 1891. It was founded by Michele Manze, whose family moved to London from southern Italy in 1878, and began selling pies after dabbling less successfully in ice-cream and ice-cream makers. For Manze, this Tower Bridge site was the first of a mini pie empire. He opened a second shop on nearby Southwark Park Road in 1908, followed by two more in Poplar and yet another in Peckham in 1927. Three were either destroyed or closed during the war but the original, his Peckham outlet, and a third on Sutton High Street remain open today. Several of Michele's brothers followed his lead, opening up their own shops bearing the family name and by 1930 there were a total of 14 of them. This includes L. Manze in Walthamstow which received listed status in 2013. In 1998 the business, now run by Michele’s grandsons, opened a final shop in Sutton, giving the family the unique claim at the time to opening both London’s oldest and newest traditional pie, mash and eel shop. Fred Cooke opened his first pie, mash and eel shop in Clerkenwell in 1862, and before long ran a popular chain with branches across east London. A Broadway Market branch opened in 1900, with Fred’s grandson Bob (who was born above the shop) at the helm. There is also a surviving F. Cooke on Hoxton Street, while a new generation of the business has been kicked off by Bob’s daughter who has opened a pie and mash shop in Harold Hill, near Romford. 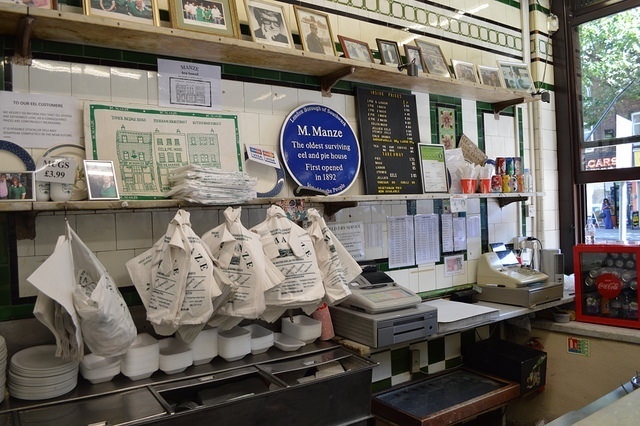 Compounding the family connection, a daughter of the Cooke family married a son of the Manze family — it is now this couple’s grandson that runs the capital’s oldest pie and mash shop, M. Manze on Tower Bridge Road. G. Kelly, which has been serving pie and mash in the same spot on Roman Road Market since 1937 — at their peak the family had six shops in the area (temporarily closed for renovation until late 2018). Goddards Pies in Greenwich is a new outlet for an old business — the family have been making traditional pies since 1890 when they launched in Deptford. Arments opened their first pie and mash shop on Walworth Road in 1914, and later expanded with two more shops in the area. Their shop on Westmoreland Road is the only one still open today and regarded as one of London’s finest. Castle's Pie and Mash right next to Camden Road station has been going strong since 1934 and the snaking queue out the door every lunchtime is filled with regulars who have been devouring their classic pie 'n' mash combos for years, not passing tourists. Harringtons in Tooting remains a family business with exactly the same recipes since they opened in 1908. They had a refurb in 2018 though, so while the food remains traditional, the interior is a little more modern. Robins Pie and Mash, established 1929, straddle the London/Essex border with shops in Wanstead, Basildon, Chingford and Romford. Very fresh, no frills and the real deal. 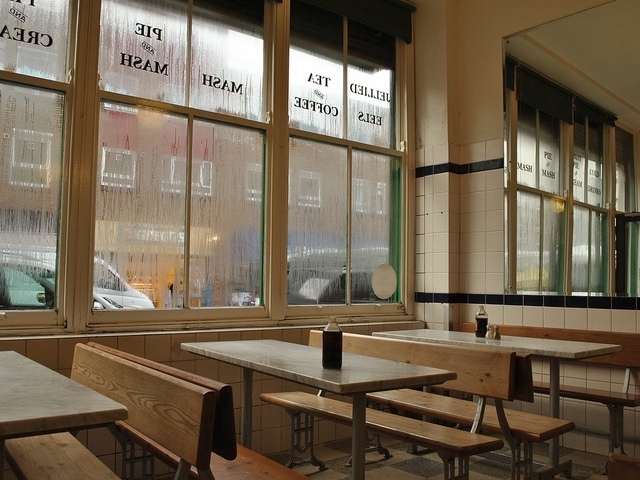 You’ll notice that all of these pie and mash shops are in east or south-east London, and that the dish has a particularly strong connection with east London. The reason is simply that this started out as cheap food and the east is where the poorer working classes lived. A prevailing westerly wind was a key factor in this, as it meant industrial pollution was blown that way making for smellier and altogether less pleasant living conditions.